Atop the escarpment above Davenport Road and just east of Spadina House, Ardwold Gate meanders through what was once the estate of Sir John Craig and Lady Eaton. Ardwold (“high on a green hill” in Gaelic) was their enormous, opulent Italianate manse, completed in 1911 and demolished only 25 years later. The grounds were then subdivided and upscale homes began to rise among the aged oak trees. In addition to traditional Georgian and Colonial styles, Ardwold Gate boasts two notable Modernist residences. 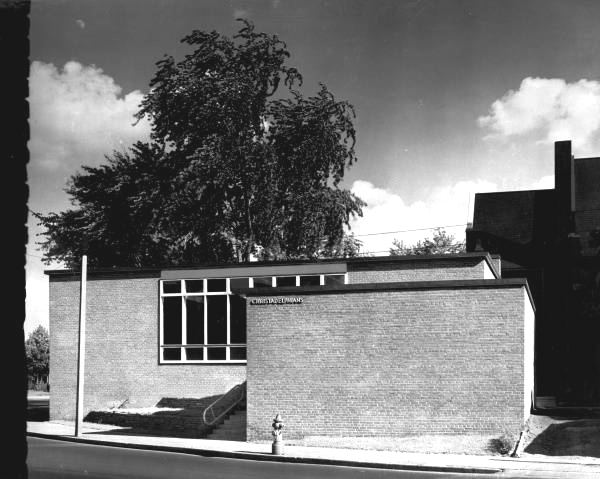 17 Ardwold Gate was designed by Gordon Adamson & Associates for St. Clair Balfour, president of the then-powerful Southam newspaper chain, and completed in 1960. The two-storey house presents a very private public face: a starkly rectilinear façade of off-white sandlime brick framed in black steel is relieved only by three windows arranged in an asymmetrical pattern. Low garden walls of matching brick further distance the house from the street. At the rear, however, rows of sliding glass doors open onto a full-width balcony and terrace, capturing southern sunlight and capitalizing upon superlative views over the city below. 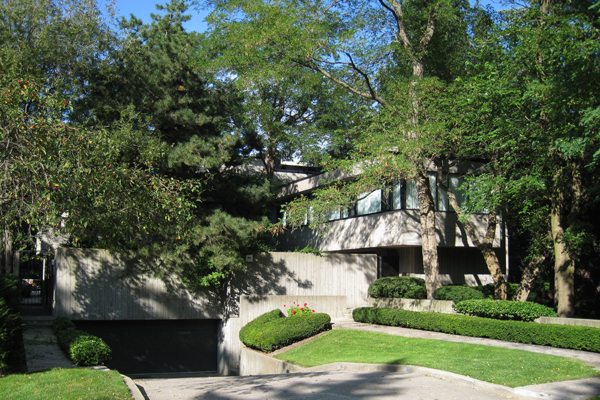 The Balfour house was a finalist in the 1961 Massey Medals for Architecture competition. 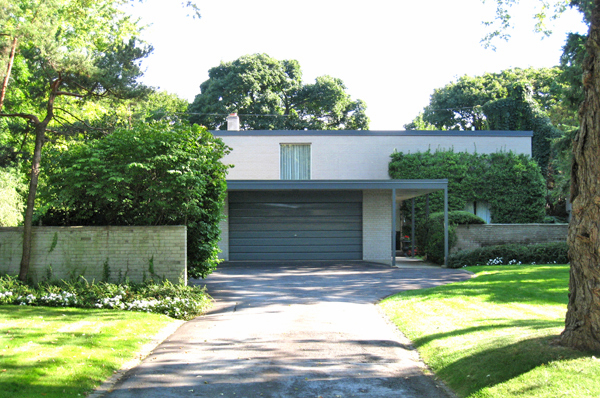 At 95 Ardwold Gate is the Richard Mauran residence, designed by Estonian-Canadian architect Taivo Kapsi and completed in 1968. It’s a striking and highly unusual example of a Brutalist house: the entire structure, including the exterior and interior walls, is of cast-in-place concrete. Kapsi used saw-cut timber forms to achieve a raw, rough-textured finish, the prominent striations adding surface interest and emphasizing the three-dimensional effect of the house’s interlocking vertical and horizontal planes. A front courtyard is screened from view; at the rear, cantilevered terraces appear to float within the dense foliage of Roycroft Park. The weighty, almost primal effect of the concrete is effectively countered by broad expanses of clear glass. Ceilings of cedar boards add a tactile warmth. The second-floor balcony overlooking the street was later filled in, slightly disrupting the house’s visual rhythm but not compromising its powerful presence. Tragically, Kapsi didn’t live to see his work completed. He died in August 1967 at the age of 31, following an altercation with intruders at a cottage north of Toronto. The Mauran house stands as a testament to his unrealized potential as an architect. Vacant and decaying for several years, Peter Dickinson’s Tweedsmuir Apartments are now being demolished to make way for a condominium development. 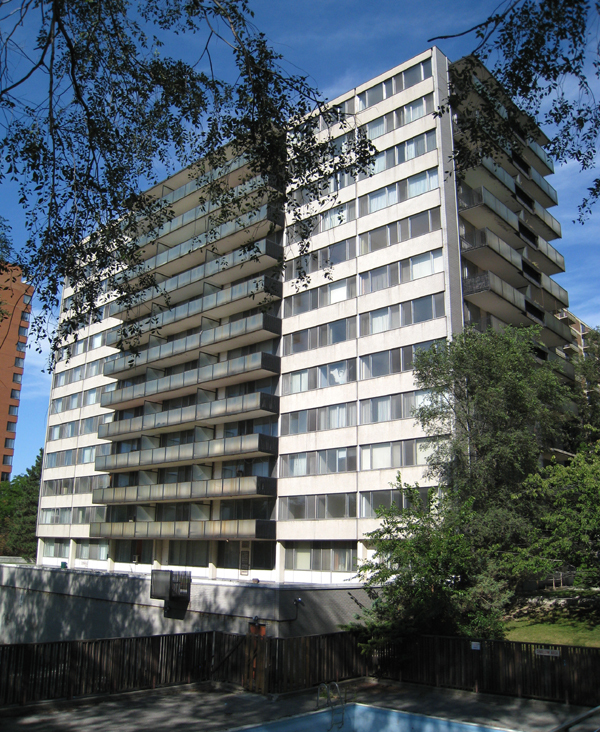 The two 12-storey towers at 310 and 320 Tweedsmuir Avenue, completed within months of the architect’s untimely death in 1961, were his last residential buildings in Toronto and the culmination of his approach to the design of luxury apartments. 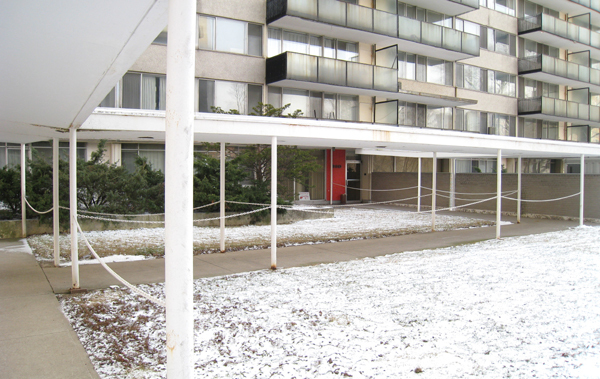 Compared to the exposed concrete floor slabs and brick infill of earlier Dickinson buildings, the Tweedsmuir Apartments show his increased emphasis on clean lines, minimal detailing and visual lightness. Curtain walls with precast spandrels faced in white stone chips, a system Dickinson first used on commercial office buildings, produced thin, crisp wall planes that appear to float independently of the structure. Balconies are cantilevered outside the building envelope, their wire-glass panels (now clouded by dirt and corrosion) enhancing the transparent effect. 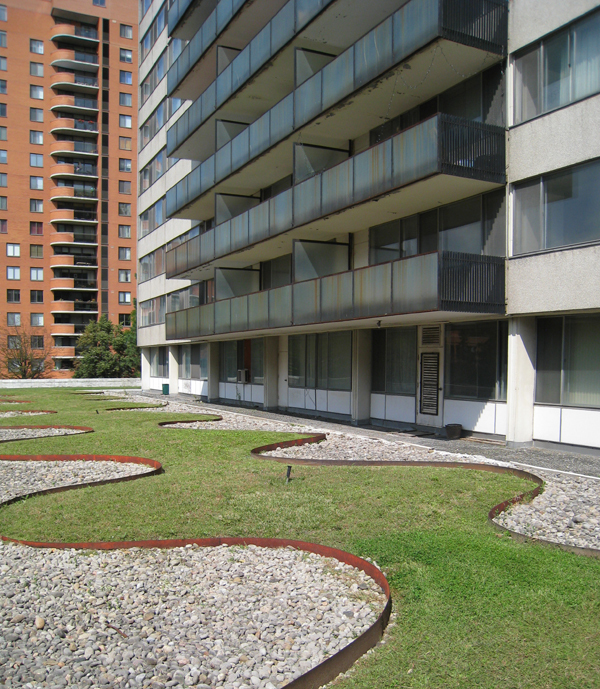 At ground level, the trademark Dickinson design cues remained: the inventively planned courtyards, elegantly covered walkways and richly finished lobbies (still with their period fixtures and furnishings) epitomize the glamour of modern high-rise living in the early 1960s. 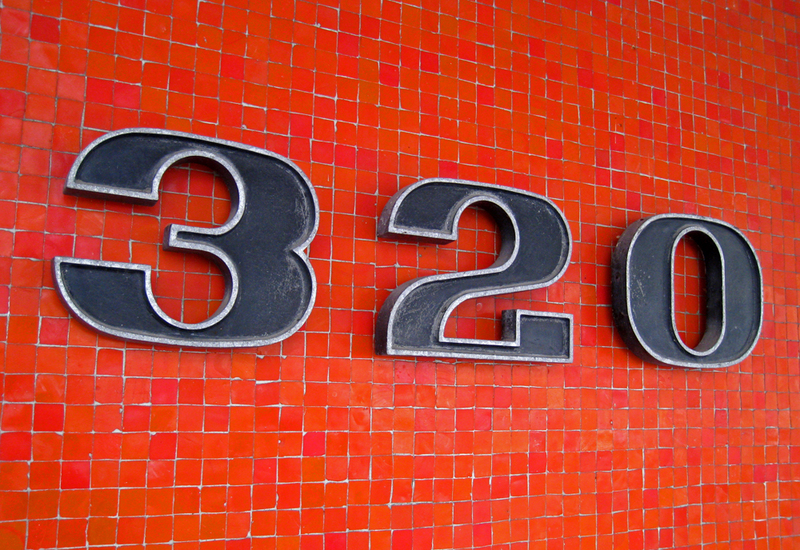 Panels of bright red and orange mosaic tile discreetly highlight the main entrances. 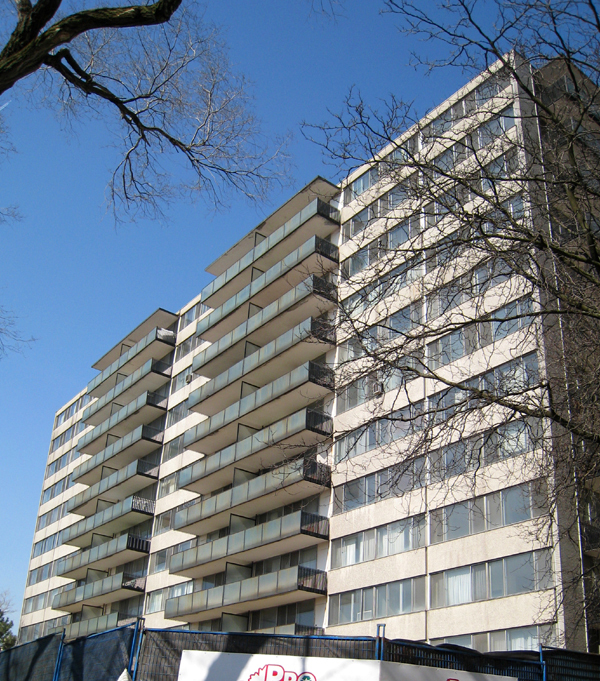 Long before the wrecking crews arrived, the Tweedsmuir Apartments appeared to be in the process of demolition by neglect: two once-fine buildings poorly maintained, then emptied of tenants and allowed to deteriorate beyond hope of rehabilitation. Their destruction is the latest stage of a contentious redevelopment scheme launched more than a decade ago, as documented in a City of Toronto report from October 2009. For a comprehensive overview of Peter Dickinson’s work, see John Martins-Manteiga’s new biography and monograph. A landmark at King and Bay since opening in 1967, the Toronto-Dominion Centre is among Mies van der Rohe’s largest and most important works. Here, the architect’s typically spare Classical simplicity, precise detailing and exquisite materials are best exhibited in the low-rise banking pavilion. Its open-span interior, framed in black steel and wrapped in bronze-tinted glass, integrates floor slabs of St. John grey granite, partition walls of fine-grained English oak, bookmatched panels of green Tinos marble and Mies’ own furniture of leather, glass and steel. Owners Cadillac Fairview and TD Canada Trust have fastidiously maintained the complex through the years and faithfully honour Mies’ most minute design details, down to the yellow daisies in spherical glass vases that are filled exactly one-third with water and meticulously arranged on desktops and banking counters. All of which makes this photo of the seating area in the pavilion’s northwest corner even more incongruous. You’ll note the misaligned (Mies-aligned?) steel base of his iconic Barcelona table – it’s at right angles to the tabletop rather than in a 45-degree X-pattern. 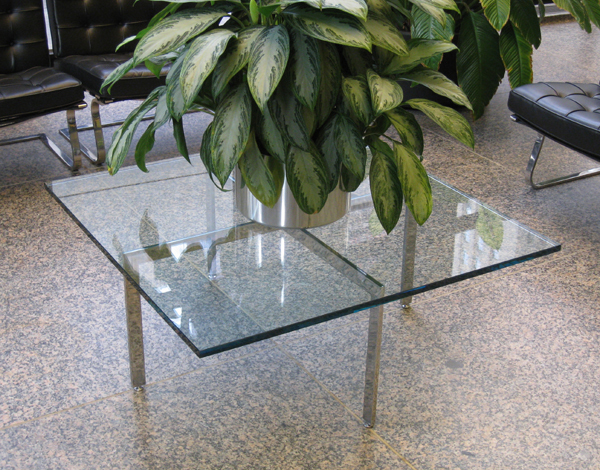 Not only is the current arrangement incorrect and unaesthetic, it’s also unstable – if someone were to sit on one of the unsupported corners, the thick plate-glass top would likely tilt off the base and crash to the ground. Mies would not be pleased.